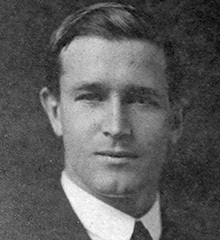 Robert Walter Morrison was the son of Robert Brown Morrison and Ruth Morrison. He was born on 11 November 1992. Walter was educated at Royal School Dungannon between 1905 and 1907. Walter returned to South Africa, where he was in business in Capetown. He enlisted in the South African Infantry. On 14th July 1916, at the Somme, the 1st South African Infantry Brigade, including Private Morison, were near Delville Wood, near Longeuval. 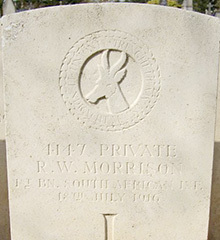 After a week of intense fighting, Private Walter Morrison, who was serving with D Company of the 1st Regiment of the South African Infantry, was shot in the throat and died later. He was 23 years old. Private Walter Morrison is buried in Corbie, which was a medical centre.